A few weeks ago I posted a story on a rare early left handed Tym Wosrite that was for sale (check it here.) 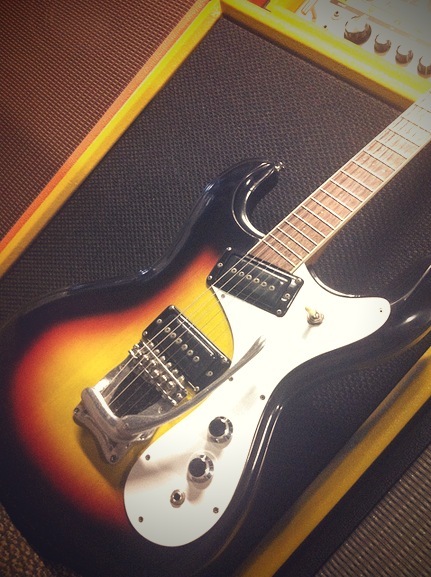 Well, another Tym Wosrite has come up for sale, this one the top of the line Versatone model. As guitars made by Tym’s are pretty rare, I thought it’d be cool to do a guitarnerd story on it. 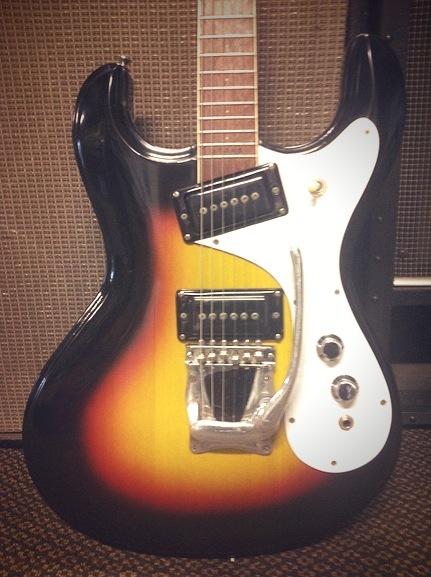 Tim from Tym Guitars is one of the world’s leading expert in Mosrite guitars. While now there are many luthiers out there making great Mosrite’s (Gunn Guitars in Holland or Hallmark), back in the early 2000′s… apart from the Japanese Fillmores etc, there was no-one. So Tim made each Wosrite totally by hand, making as much of the parts himself as he could. 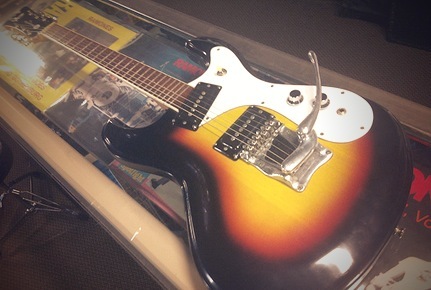 The pickups were hand wound replicas of Tim’s 60′s Mosrite pickups. Tim could custom wind them to suit the individual customer, so if they needed to be hotter or whatever, he could make them to suit. The most impressive part is that Tim hand made the tremolo. While most other Mosrite makers now use either Japanese ‘Excellent’ or Hallmark bridges, Tim cast an aluminium replica himself. It’s heavy duty and shows the lengths Tim went to to get the guitar right. 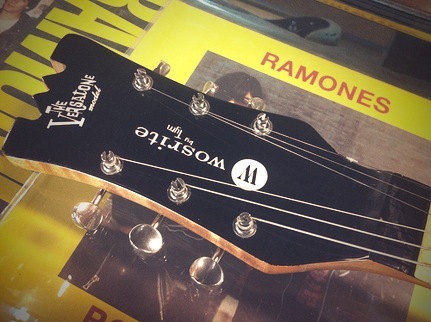 This particular Wosrite is based on the larger headstock model of the late 60′s/early 70′s. It has a massive flat area behind the nut that slopes down after an inch… Tim says that’s how the originals were. Bizarre. 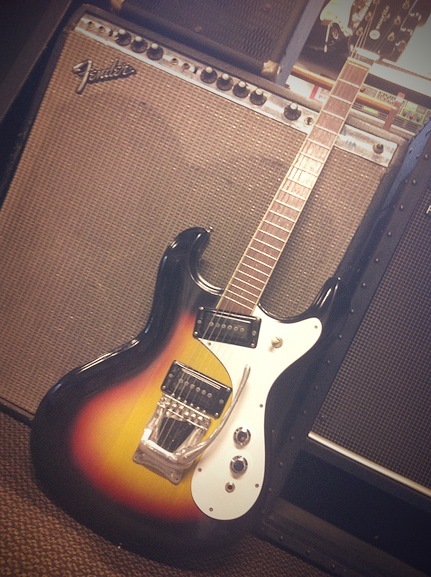 The name ‘Versatone’ is actually the original band name of the Ventures, who this Mosrite model was originally named after. Tim’s wife did up the graphics and did a fantastic job. The neck is made of some slightly figured wood which I’m not sure what it is. Tim uses a lot of Australian wood for his guitars, so it could be Queensland maple. The fretboard is most definitely Jarrah, which is as hard as ebony.The neck profile is comfortably thin but not the Ibanez Wizard neck thin of some of the 60′s Mosrites I’ve played. It’s a nice solid beast, less flimsy feeling than the original 60′s model Tim lent me once and more of a substantial instrument. It’s not Les Paul heavy… more like a decent Strat. 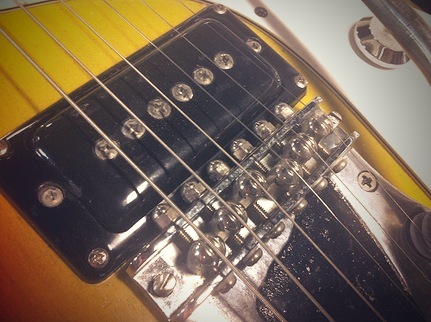 The neck pickup is a monster, very big sounding and round… with nice attack but a lot of bottom end. 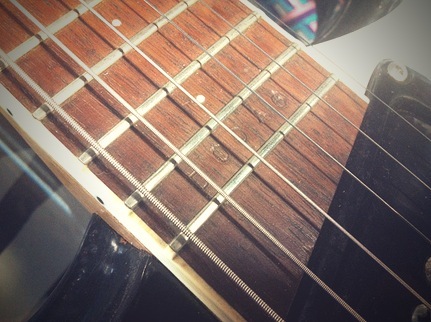 The bridge pickup has a noticeable level drop, and is a lot more bitey. Together they have a nice mid rangey sound with a bit of that ‘honk’. 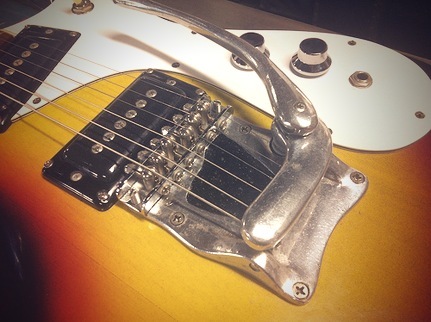 The tremolo is very delicate feeling… the arm only has a little travel so there’s only room for a small wobble. 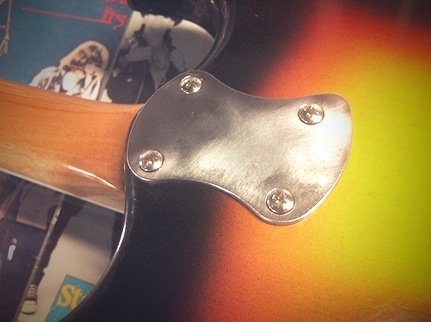 It holds it’s tune very well though, due to the Mosrite roller saddles on the bridge. If you’re interested in this guitar, contact Tym Guitars. Due to the popularity of his effects pedals, Tim doesn’t have time to make guitars anymore, so if you’ve been looking for one of these… this is probably you’re only chance to get one. Still looks good 10 years on! 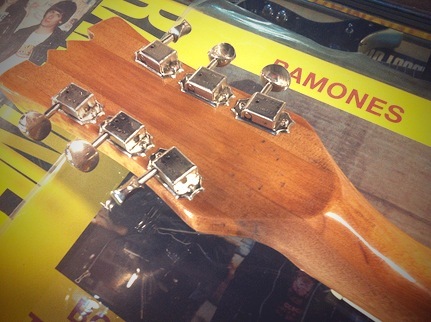 I know the early hot formed pickups were a challenge to get right …. ( Tim can tell you the full story ) BTW I still have 2,000 pole-piece screws!! !